Fellow retro enthusiasts, I posit the question: Did emotional engagement between game and player exist a decade or three in the past? This thought has crossed my mind occasionally and, in the instances I can dwell for longer than a moment, I struggle to find an answer in the affirmative. Certainly in the last ten years we’ve seen a focus from many developers in engaging the player on a higher level than the reflex, memory or ‘twitch’ gaming; a genuine effort to reach the audience in more interesting ways. Fable, Braid, Dragon Age, Mass Effect, The Sims, the list goes on. But dive down the vortex of time past these and you might be struggling for examples. Were players actively engaged on a romantic or other emotional level beyond the perfunctory? Sonya Blade might have looked great in Mortal Kombat, but no one cared about her quest to capture Kano. “Blast off and strike the evil Bydo Empire!”. The opening line to R-Type, a classic scrolling ‘shmup’ from 1987, sums up in one line what nearly thirty years of gaming was generally based on. Jim McCauley, in the book 1001 Video Games You Must Play Before You Die, elaborates on the themes so prevalent: “So much of the early history of gaming is focused on space and war, subjects guaranteed to appeal to the young male audience that filled the arcades of the early 1980s”. Space and war – often both at the same time – were certainly popular. However, there were the occasional branches out. Japanese developers perhaps more inventive, and characters sometimes mattered as much as blowing them up. Two characters that blew up their enemies in entirely different ways were Bub and Bob from the blockbuster Bubble Bobble in 1986. On the surface there doesn’t seem to be anything noteworthy here in regards to our quest, but looks can be deceiving. In fact, this is one game my mind consistently references when thinking about this issue. Bub and Bob are a team and, to rescue your father from alcoholism and reunite your mother and family, you have to have a friend. Story wise it’s your brother, Bob, but in the real world a second player controlling him is required to ever finish the game properly and with the ‘Happy End’. 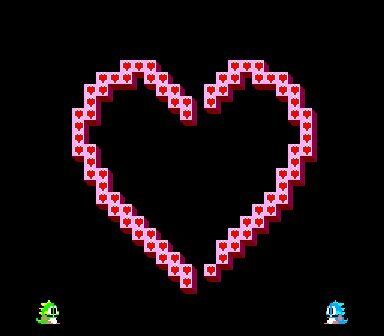 Here, the developers of Bubble Bobble not only touched on the themes of co-operation, love and family, but enforced it by ensuring another person be present for the ride. Having said that, it’s not as grandiose as it sounds. This hidden story of Bubble Bobble is very much just that, hidden. To find this ‘true’ narrative, secret rooms must be entered, codes deciphered, button combinations used to unlock modes, and then, finally, finish the game with a friend. Once it’s over the players are in for a surprise as the love heavy ending bursts forth from the screen in dazzling colour. Though unexpected, it is wonderful. Further back in time, co-operative games in the 70s were common out of necessity. Back then when our beloved industry hatched, playing alone often wasn’t an option; artificial intelligence was in its infancy. Many Pong variants required two players because, simply, there just wasn’t anyone else to return your serve. But this doesn’t touch on our question, as another person at your side isn’t the connection we are looking for. Love doesn’t often bloom by sharing a controller, and even on the occasion it does the game acting as the intermediary plays little part. On the contrary, a co-operative game of say, Double Dragon, is more likely to create anger than romance, as the so-called ‘partner’ in game consistently smashes your face with a bat. Hilarious, sure. But not first date material. So finding examples of emotionally engaging video games going back a few decades is difficult. 1994’s Super Metroid tugged the heart strings in the final moments and quite effectively too, but the relationship ripped asunder fleeting. Instead we look to the modern era of gaming for the majority of examples and one would have to wonder why. Is this leap due to a societal need or an expansion of technology? Do the people of today desperately seek a kindred spirit in an impersonal world or, with the strides in technology and social media, we simply now have the power to do so? One would think technology plays less a part due to the evidence brought forth by master designers such as Jason Rohrer. Games full of character and emotional highs and lows that wouldn’t look out of place on a Commodore 64. So perhaps people really are looking for greater emotional interaction in their game worlds. Perhaps – with the average age of gamers in their mid thirties and females making up half the number – we really have grown up and the young male of the early 80s need not apply. Or perhaps, fellow retro enthusiasts, you have great examples that prove we were given these experiences all along.